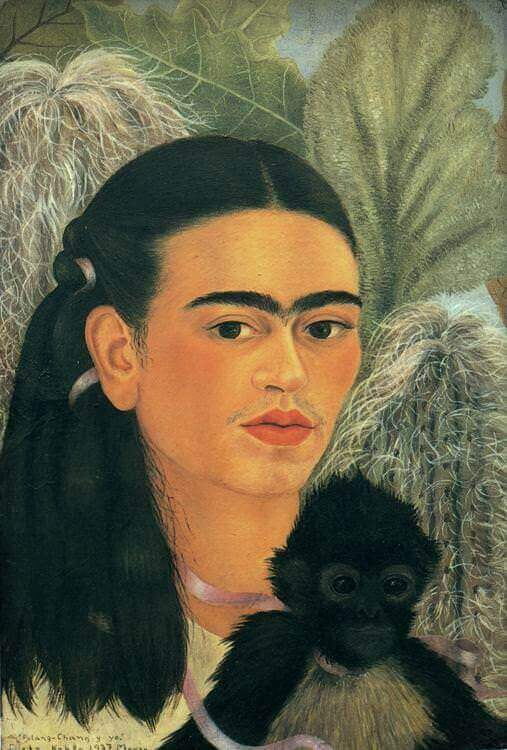 In this painting, Fulang-Chang and I, Frida Kahlo painted herself with one of her pet monkeys. Lots of people believe the monkey represents the surrogate of the unborn children she and Diego Rivera cannot conceive. This painting was first displayed at Julien Levy Gallery in New York in 1938, which is the first major exhibition of her work. The Surrealist leader Andre Breton wrote an essay about this show and described Frida Kahlo as a self-created Surrealist. He mentioned Kahlo's work as "a ribbon around a bomb" and hailed to her as a Surrealist. Frida responded his enthusiasm for her work with appreciation but did not agree on his comments: "They thought I was a Surrealist but I wasn't, I never painted dreams. I painted my own reality." This is the first self-portrait Frida painted with her pet in there. In the later years, she drew many other her pets in her self-portraits, such as parrots, dogs, and cats. In this painting, a lavender ribbon connects a seemingly cheerful and brilliant Frida with her companion. Frida was in the prime of her beauty when this self-portrait was painted. She was also having a secret love affair with Leon Trotsky, which confirmed her seductive sexual powers. She was very proud of this painting and gave it to her friend Mary Schapiro Sklar, who is the sister of art historian Meyer Schapiro. Along with the painting she gave her a mirror with the similar frame. Frida told Mary that the painting and the mirror should hang side-by-side so that Mary could always see herself next to Frida.